Many Americans believe liberals dominate our media, and it turns out they may be right. Crowdpac, a non-partisan political data analysis company, used more than 30 years of federal campaign finance records to estimate where donors to political campaigns stood on the political spectrum. Donors were scored as being more liberal or more conservative based on the ideology of the candidates they gave to. In a data set Crowdpac provided to Business Insider, the company broke these estimates down to indicate whether individual professions were dominated by liberals or conservatives. Among many other interesting results, the data shows that donors who work for newspapers or other print media skew extremely liberal. 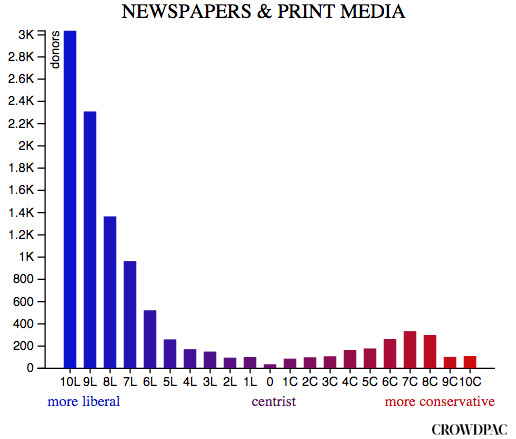 This chart shows the number of donors in the media who were assigned to each ideological score.